Cold Beer, Hot Lights: 2045 | SPACE-BIFF! The only hit I ever landed in baseball was against a robot. Yes, it was a pitching machine; yes, it gave me the confidence I needed to stride right up to the plate during our next game and swing away; yes, I got beaned in the helmet and walked to first. So it would be safe to say that baseball isn’t my thing. When I overheard someone talking about Arnold Rothstein’s 1919 World Series fix, I figured that was the coolest thing that had ever happened to baseball. If gangsters were more regularly rigging the game, I might consider following it. 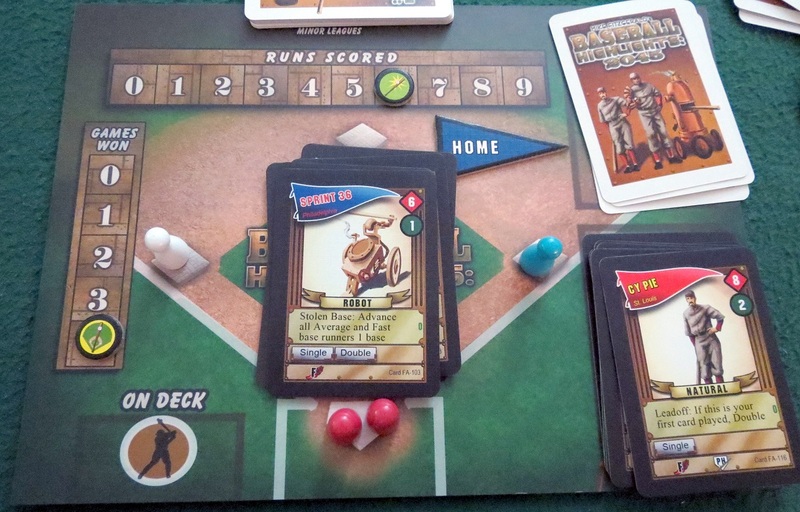 Baseball Highlights: 2045 might be about baseball, but somehow it manages to be one of the most engaging deck-building games I’ve played in a very long time. For one thing, in the utopian future that serves as its setting, even the people who like baseball have finally admitted that baseball is sort of boring. To spice up their stale ballpark franks, they’ve shortened the game to six innings and allowed cyborg and robot players into the game. Let’s allow that to sink in. Cyborgs and robots. Even better, you’re not actually forced to sit through an entire game. Instead, contestants control opposing innings simultaneously, using their players to both field and bat at the same time. It’s a slightly difficult system to grasp right away, if only because there’s nothing quite like it. See, both contestants act even when it isn’t their turn, either playing a card or resolving their hits. For example, if your opponent is “threatening” a pair of doubles, you might play a card that cancels one of them. They would then make their runs (in this case the remaining double), and then you would add pawns to home base representing your own threatened hits. These “ballgames” last maybe five minutes at most, only six cards per side, and while the decision space sometimes feel constrained by this six-card limit, it’s more often satisfying and conducive to clever plays. Some players excel at hitting — or even at simply adding runners who round the bases faster — while others are better at fielding, canceling hits, walking players, or picking off base runners, and choosing when to threaten hits or cancel enemy runs is a tense game of wits. Players can also be banked “on deck” between games, ready to be deployed at an opportune moment. There’s nothing quite like canceling a game-winning home run with a surprise play. The roster that won me the 2045 World Series. The deck-building also gives its contestants plenty to chew on, revolving around an entire season plus the World Series. In between games you total up your ticket revenue — yet another part of Baseball Highlights that’s perpetually interesting to engage with, as the hard-hitting robots and cyborgs often draw less revenue than flabby non-augmented “naturals” — and use the proceeds to draft new players. Your deck is always fixed at exactly 15 players, leading to tough decisions as you decide which players to cut to make room for fresh blood. Even many of the starting rookies bring useful skills to the table, and removing your last good fielder for better hitters can come back to bite you on the seat of your chaw-spattered pants later on. As much as I find baseball tedious, I cannot overstate how much I like this system of quick-playing mini-games interspersed with sprints of player drafting. Even the baseball stuff is compelling, dolled up as it is with mechanical players. Oddly, it’s helped me understand, in the tiniest, most insignificant way, why some people might like this sport. In fact, the four-contestant World Series made for one of our coolest game events of the year, coming down to the final game of the Series between teams that had developed their own specialties and weaknesses over the course of about a dozen ballgames each. By that point, I knew my team at a level I haven’t encountered in a deck-building game in… well, almost ever. 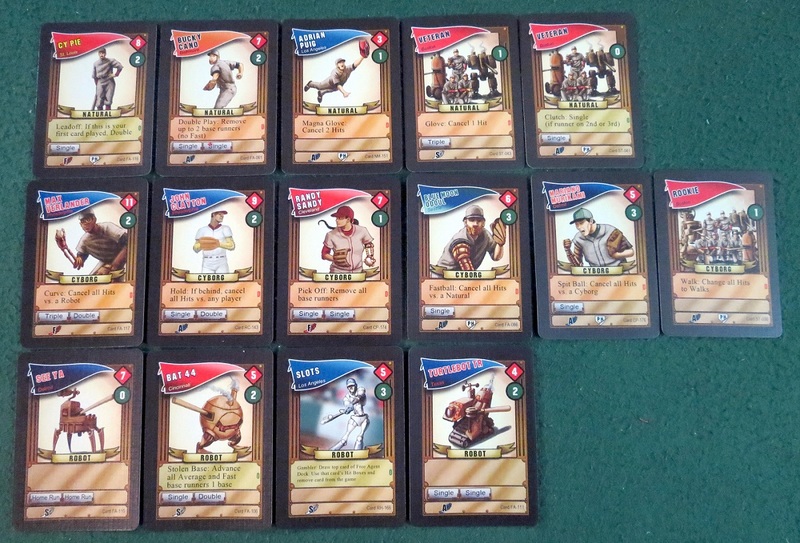 Each and every card was integral to my strategy, from key players who acted as team lynchpins to pinch hitters for bringing my on-deck player into the game. I had guys who could hit multiple home runs back to back, basemen who could pick off a pair of runners in a single play, a leadoff hitter who gave me a runner on second right at the start of the game, and a robot who could duplicate any of my other players’ actions. Even so, there were deficiencies, a lack of hitters for simply putting runners on base, meaning that most of my home runs resulted in only a single point rather than bringing home a full load of players. My opponent had also been paying close attention and knew he could undermine my deck with players that targeted cyborgs, making our final best-of-three ballgames far more terrifying than they had any right to be. 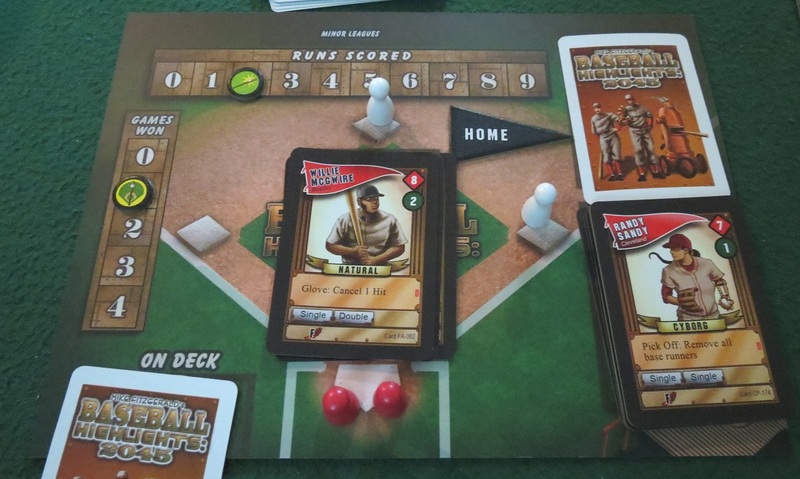 To my surprise, as I gripped my hand of players, agonizing over whether I should bother playing a cyborg until I had a better idea what my opponent’s strategy was, I was heavily invested in a game of baseball. Robots win games but don’t sell quite as many tickets. Sadly, there’s one big downside that brings a very real chance of spoiling the day with a Bronx Cheer. As this game was funded on Kickstarter, there are already quite a few expansions out there, billed as stretch goals to entice people into funding the campaign. If you can get your hands on the Deluxe Edition (for a significant bump in price), everything comes bundled together. However, the regular edition is missing over 40 cards that feel very much like they should have been included in the base game, especially the “teamwork” players who synergize with their teammates, letting you specialize in naturals, cyborgs, or robots for greater effect. These cards aren’t at all necessary to enjoy the experience, especially since the basic free agent deck is already plenty deep, but it’s a shame the full experience wasn’t the default option. Either way, for baseball lovers and haters alike, this is definitely one I recommend trying out. It’s innovative, fun, and contains plenty of tense plays, solid deck-building, and a sort of whimsical approach to its subject matter that I heartily approve of. To put it in language you baseball folks might understand, it hits a regular tape-measure blast in fine Ruthian fashion. Posted on April 30, 2015, in Board Game and tagged Baseball Highlights: 2045, Board Games, Eagle-Gryphon Games, The Fruits of Kickstarter. Bookmark the permalink. 5 Comments. As far as you know, is the Deluxe Edition only available from Eagle-Gryphon games? Thanks. I’d like to pick this up, but at $65 for the bundle, it’s not budget-justifiable. Never mind. Mine was a hasty comment made in the throes of disappointed excitement. Thanks for the write-up. Did you figure out the answer to your question? Because I’m not sure. As far as I know, the Deluxe Edition is only available straight from Eagle-Gryphon, and yeah, it’s rather expensive. Pingback: Baby, It’s Cold Outside | SPACE-BIFF!